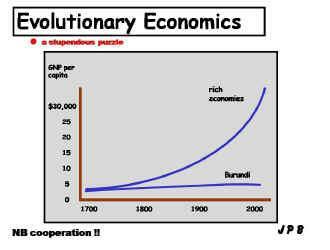 Evolutionary Economics ... Dixieland Jazz ... there is an evolutionary explanation for everything ... any interest? In 1859 Charles Darwin explained how economics & jazz and everything else evolved ... including families, beer prices, factories, saxophones and the Boeing 747 ... an extravagant claim? ... yes ... but relentlessly, every day, the supporting evidence from empirical science mounts ... these pages hail one of the men who made the understanding of complexity possible ... a dwarf standing on the shoulders of an army of ancient ancestral giants can see a long way ... and what a view! Once the genie was out of the bottle the search was on and all happenings become exciting opportunities for survival rather than fearsome problems. We guess you may think that economics and jazz are a bit 'way out' but they can be fascinating to study ... are they really adaptations? ... here you will find a light hearted Darwinian look see. Economics is involved more & more in the analysis of a stream of outrageously arrogant policies but the 'dismal science' is far too often locked into simpler mathematical models with unrealistic assumptions ... the result; bum predictions which don't work. 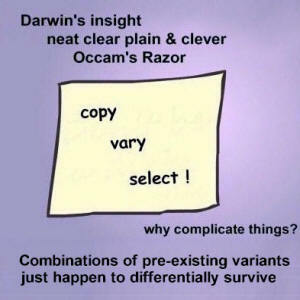 Evolutionary Economics cuts the crap and assumes nothing but a simple copy / vary / select process, making no prediction of outcomes about an unknowable future. Perhaps soon, as Darwin himself suggested, all human behaviour will be understood as evolutionary and Evolutionary Economics will lose the qualifier and come of age as 'Economics' ... the science of the quaint but convoluted behaviour of folk? Music is enjoyed everywhere and some folk even have a go at jazz but it's not easy and most run of the mill teachers tend to ignore the early innovations in 'Dixieland' which evolved into a genuinely new species of music, 'Jazz' ... a quaint but convoluted folk music? If you have any interest in these notions maybe some of the pages around here will be fun and generate some enthusiasm ... and maybe some useful insights ... all these notes have been discovered & accumulated over the years to help us with our own studies ... but remember ... it's all a bit of fun ... not about what is but just about what maybe? How to understand Evolutionary Economics is here! 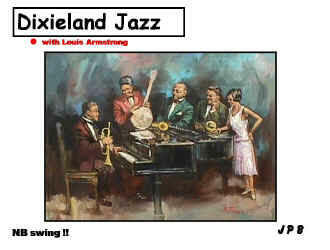 How to play Dixieland Jazz is here! 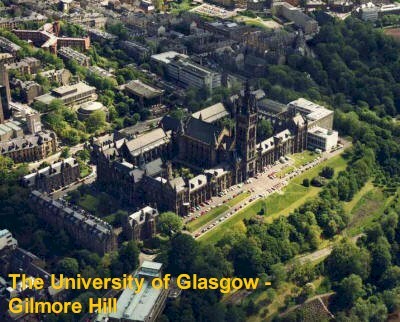 How to study Family History is here! but as the man said, 'if you think education is expensive, try ignorance' ! ... most folk just don't get it? ... but if they do the implications are shattering ... shattering because Darwin's insight describes change & survival progress as a process of weeding out failures and not the intelligent design of good works ... weeding out failures must be good news ... and exciting fun. 'meddlers, the lot of 'em, they're up to no good'! Natural selection has no foresight, so what are they all arguing about? Natural selection is emphatically economic; relentlessly cutting losses and chasing profits ... a creative destruction process. So stick with the knitting of Empirical Science ... 'top down' doing can only be experimenting in the local environment with hard work, honesty & thrift ... some experiments work and are remembered ... but most fail ... think about it? 'there are many more ways of being dead than alive'? 'What really happens is that the gene pool becomes filled with genes that influence bodies in such a way that they behave 'as if' they made complex, if unconscious, cost/benefit calculations for survival'. Richard Dawkins -The Selfish Gene, 1976. ‘The key to doing well lies not in overcoming others but in eliciting their cooperation. Individuals don’t have to be rational; the evolutionary process alone allows successful strategy to thrive, even if the players do not know why or how. No central authority is needed, cooperation is self policing’. The Evolution of Cooperation, 1984. 'There's no right or wrong ... just some choices that sound better than others. Try, there's no shame in failure, there's only shame in repeating failures'. Jazz, 2000. 'In August 1838 Charles Darwin came to study ... in particular Adam Smith ... his focus was on the individual as the central element in his theory ... the Scottish Enlightenment view of trying to understand the whole in terms of the interactions of individual parts. By July 1839 Darwin had an evolutionary view of everything around him: the planetary system, our own planet, its geology, its climate, its living organisms and their social organizations. The mechanism of this evolutionary process was accounted for by the invariable Laws of Physics and Chemistry and the principle of natural selection ... 'The Origin of Origin Revisited, Brandeis University, Waltham, Massachusetts, 1977.